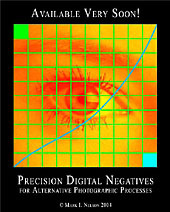 Precision Digital Negatives for Silver & Other Alternative Photographic Processes is an illustrated eBook that provides a wealth of information about how to fabricate digital negatives for contact printing with gelatin silver and any alternative photographic process. The book describes an ingenious new method—Color Density Range Control (patent pending.) Color Density Range Control is a method of matching the density range of the digital negative precisely to the exposure scale of any process and/or contrast mix—before applying a Process Adjustment Curve. Thus the required adjustment curve is much less drastic and more image tones are preserved. The book takes you through image capture with scanner or digital camera, image file preparation, calibration, creating digital negatives with any output device, evaluation of the print, and troubleshooting problems with negatives and/or the alternative processes. The book provides an understanding of how digital negatives really work and why they sometimes fail. The CDROM contains the book, Curve Calculator software, and a variety of image files, or Palettes designed to make calibration with this new method as simple as possible. All you need is a computer, printer, scanner or densitometer, Photoshop, Microsoft Excel, a standard step tablet, and the desire to make the best possible digital negatives tailored to your workflow.